I am currently feeding my mini (32 lbs) homemade meatloaf with pumpkin in the morning. and 1/4 cup of Iams, and a piece of meatloaf in the evening. She is doing well on it. Solid poops, uber high energy, lovable sass pot. I want to get off Iams dog food due to the amount of fillers they load it up with and the semi low quality of the food. Ive been looking into Fromm and Orijen. 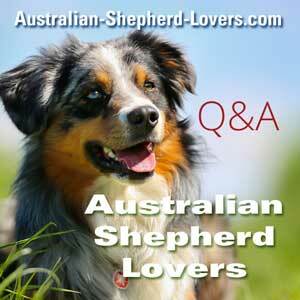 We are all Aussie owners right, so we know they have non stop energy, and always on the go. What do you feed your dogs? What works with them? Do you know how many grams of protein and fat is ideal for an Aussie? Comments for What Do You Feed Your Dogs? Homemade food using recipe from Dr. Becker's book "Real Food for Healthy Dogs and Cats". Change type of meat periodically. Add vitamin/mineral mix also using recipe from that book. For calcium, dry egg shells and grind them in a small grinder that was made for grinding coffee beans. Supplement with small amounts of probiotics and krill oil.